Conservation of a critically-endangered crocodilian. As I sat watching the sun set over the Rapti River on the border of Nepal’s Chitwan National Park, just down an embankment only 50 metres away lay one of the world’s most critically endangered species of crocodile, the Gharial (Gavialis gangeticus). I had mixed feelings as I watched this ancient and magnificent creature pick herself up and slowly return to the water, which still glistened with the suns final orange rays for the day. On one hand, I felt honoured to have witnessed such a rare and unique species in its natural habitat however at the same time I also felt a deep sadness that the future for this animal and her kind is not looking particularly positive. But despite reason for concern, all hope is not lost for the Gharial. Thanks to a dedicated team of conservationists and some government and international assistance, the battle to bring back the Gharial from the brink of extinction is still waging and is far from over. The name Gharial is derived from the Nepalese and Indian word ‘ghara’, which is a traditional clay pot used for food storage and cooking. Adult male Gharials develop a large, cartilaginous growth-like structure on the end of their long, narrow snouts which resembles this pot. Scientists believe that this bulbous structure is used for sound resonation during courtship and it also distinguishes Gharials from all other extant crocodilians as they are the only species to demonstrate visible sexual dimorphism. Male Gharials may reach lengths of up to six metres, but on average are between three to five metres long and can weigh up to 250kg. Female’s average at about 2.7-3.7 metres long and may weigh around 160kg at maturity. Dorsal surfaces of the Gharial are dark grey-black and their ventral surfaces are a yellow-white colour. Perhaps the Gharials most distinguishing characteristic is their extremely narrow, slender snouts. Being almost exclusive fish eaters these snouts are a useful adaptation for slicing through the water with minimal resistance to catch their prey. Juvenile Gharials feed predominantly on small fish, tadpoles, insects and frogs whilst adults feed on large fish and some crustaceans. Gharials are ambush predators and will lie and wait along the edges of rivers and waterways or sit on the bottom awaiting fish to swim past. They rapidly swing their head to the side capturing fish in their powerful jaws lined with razor sharp teeth. Some Gharials have been observed ‘herding’ schools of fish into shallow waters with their bodies and tails in order to catch them. Male Gharials become sexually mature around the ages of 13-15 whilst females are often mature by 12. Like many other crocodilian species, male Gharials exhibit an impressive courtship display in order to attract a mate. These displays include many different loud vocalisations and females will show their receptiveness to mate by raising their heads above the water. In Nepal, mating usually occurs around January to February with nesting taking place during the dry season in March to April. During the night females will emerge from the water and lay between 15-60 eggs in a large hole in silt or sand on the river bank. 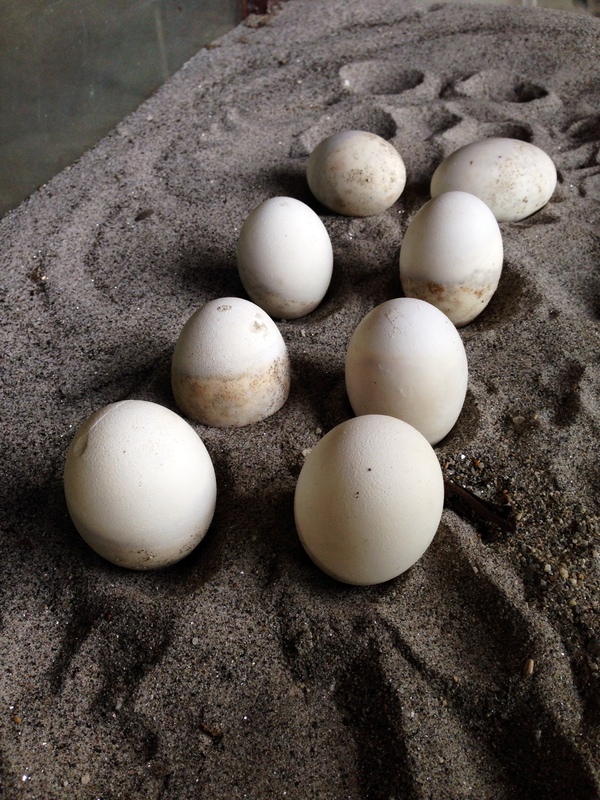 The incubation period for the eggs is between 65-90 days. Hatchlings emerge in June or July before the monsoon season begins and will vocalise to their mother who digs them up from the nest. The female may sit and guard the nest for a number of days until all hatchlings have emerged and made their own way to the water. Of the 23 crocodilian species alive today, Gharials are amongst the top six most critically endangered and according to the IUCN Red List, their wild populations are still in steady decline. Gharials once thrived across all major river systems of the Indian sub-continent but sadly today are extinct in most of these and have now been reduced to less than 2% of their former range. Before mass human migration into Gharial habitat, populations were once estimated to be between 5000-10,000 individuals. In 2006 a wide-scale population survey was carried out and the results were devastating. The wild population of Gharials was estimated at only 235; 200 individuals in India and 35 individuals in Nepal. Despite conservation efforts wild Gharial populations were still rapidly declining. Like most endangered species today, the primary cause for the massive population declines of Gharials since 1946 can be attributed to habitat destruction. With mass-scale human migration into previously uninhabited areas, riverine crocodile ecosystems were transformed for agricultural use. Today, more than 15 million people are living throughout the Terai Valley and surrounding areas, which was once abundant with numerous wildlife species. Dams, irrigation canals, artificial embankments and changes in river course have all substantially contributed to the Gharials rapid decline. Furthermore, intense over-fishing of waterways has all but removed the Gharials source of food and adult Gharials often get caught and drown in large fishing nets. Gharials have been hunted for their skins and parts of their bodies used for Asian ‘medicine’ and their nests were frequently raided and eggs collected for food. 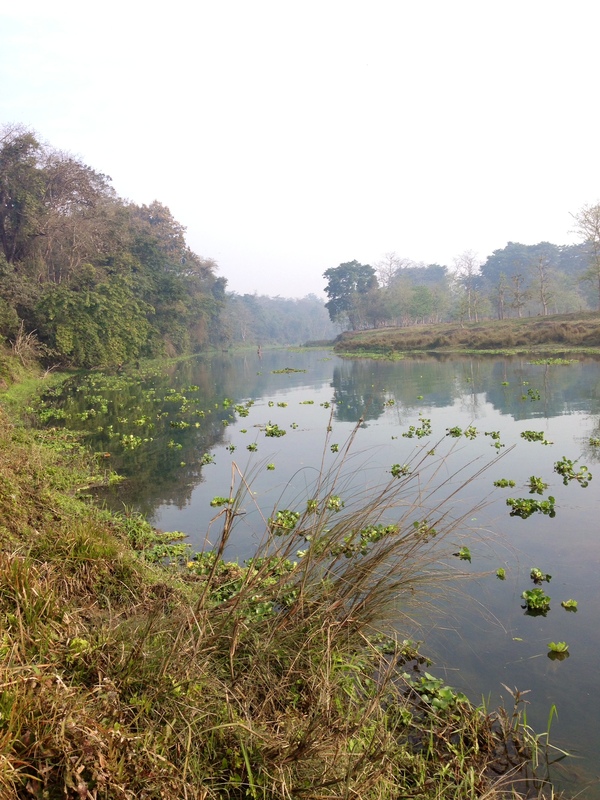 Further, many of the rivers and waterways that Gharials once thrived in are now used as major sites for domestic and industrial waste disposal. 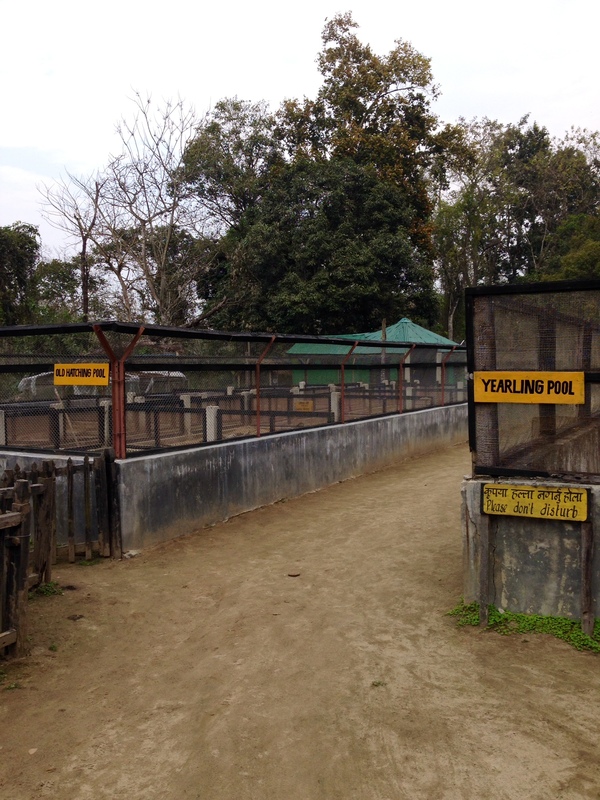 In response to the devastating population declines of Gharials throughout Nepal, the Nepalese Government in collaboration with the Frankfurt Zoological Society and WWF Nepal initiated the construction of the Gharial Conservation Breeding Centre inside the Chitwan National Park in 1978. 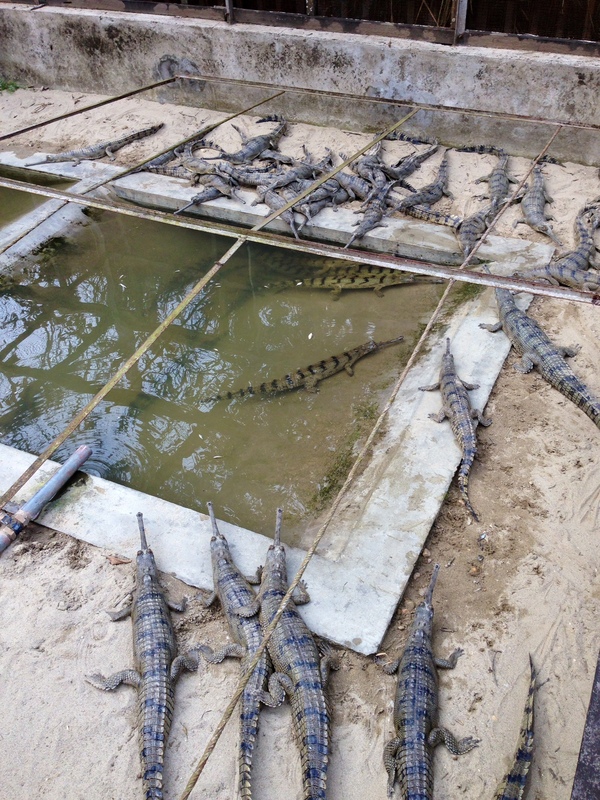 A number of adult specimens were caught and many wild eggs harvested that year in order to begin the breeding program and by 1981 captive bred Gharials were being re-introduced into various river systems of the National Park. These early attempts proved to be largely unsuccessful as the captive bred Gharials were released too young and were also placed in inhospitable habitats and most succumb to predation or were washed away during the monsoon. 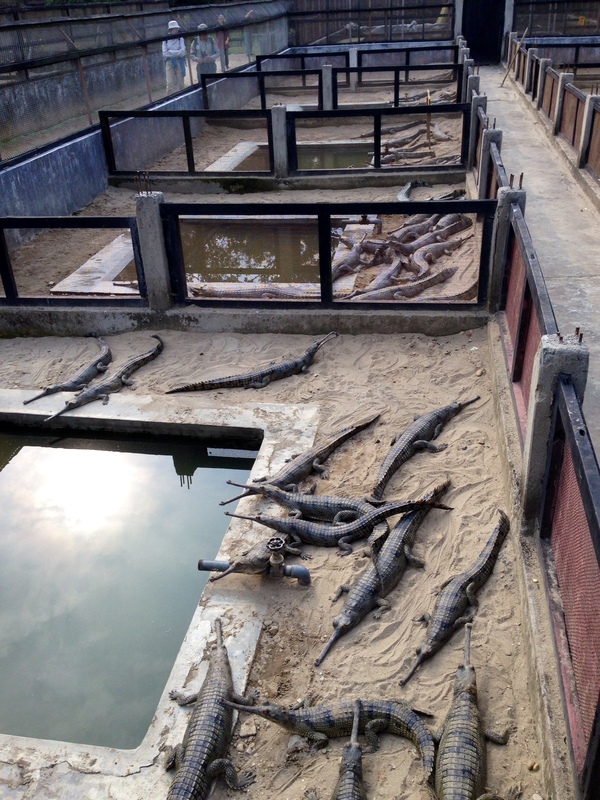 However, over the past three decades the breeding and release techniques have been highly refined and the Gharial Breeding Centre now stands as the last hope for the species’ survival. Recently I had the opportunity to visit the Gharial Breeding Centre and was impressed with the simple, yet professional set up. 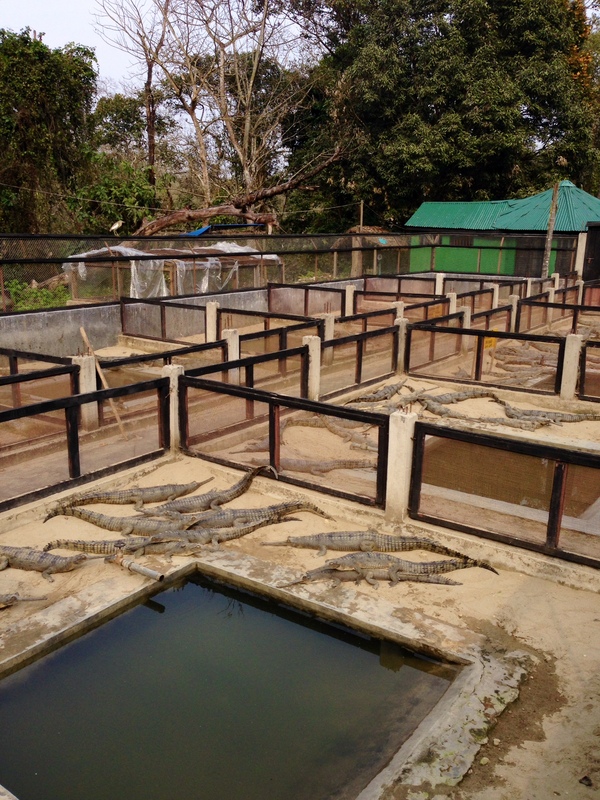 The Centre is made up of many divided enclosures with Gharials of similar sizes and ages housed together. When hatchlings are removed from the incubator around mid-June, they are placed into divided pens inside a large greenhouse for the first 12 months of their life. 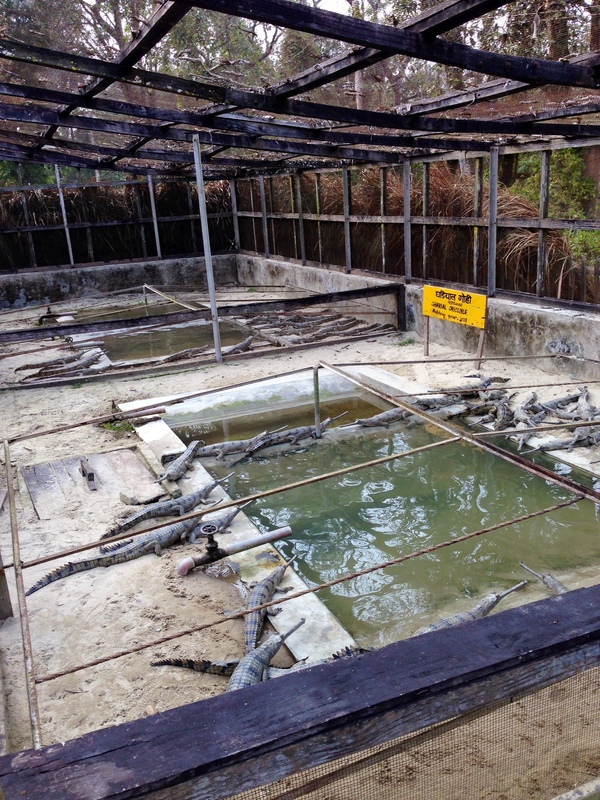 Shallow concrete pools which can be completely drained were constructed in the centre of each of the enclosures with sand used as the substrate surrounding the water. The greenhouse allows for accurate control of temperature and humidity levels whilst the hatchlings are at their most fragile stage. For the first few months the hatchling Gharials are fed small, fresh fish every second day and are fed only at night. After two to three months, they readily adjust to being fed during the day and will ferociously feed on any fish thrown into their pools. Each individual hatchling is also administered vitamin supplements via syringe on a regular basis up until six months of age. Pools are emptied and cleaned daily and potassium permanganate is added to the water to prevent bacterial and fungal growth. The high level of care and hygiene was evident at the centre with the local staff taking great pride in the important work they were carrying out. I was fascinated to see the adult breeding pools at the centre and to truly appreciate how large these freshwater crocodilians can really grow! They put our Australian Freshwater Crocodiles (Crocodylus johnstoni) to shame and easily rival in length some of the largest Saltwater Crocodiles (Crocodylus porosus) I have seen. Each of the adult breeding pools contained one large male and three to four females. Some of the breeding males at the Centre were around 50-60 years old and greater than five metres in total length. Each year, the female Gharials lay their eggs in the sandy banks of the enclosures and these are carefully collected by staff and placed inside large incubators. Juvenile Gharials are reared at the centre for approximately five years until they reach lengths greater than 1.5 metres long. This size gives them the best possible chance of survival once they are released into the wild. Once a suitable release site has been identified within the National Parks vast boundaries, the Gharials undergo a ‘soft release’. A small group of Gharials are placed inside an enclosure constructed on the side of the river made from elephant grass, a tough grass that the locals often use as thatching for the roofs of their homes. The Gharials will remain in this enclosure for between 15-20 days, after which the elephant grass begins to decompose and the Gharials can make their way into the river system. 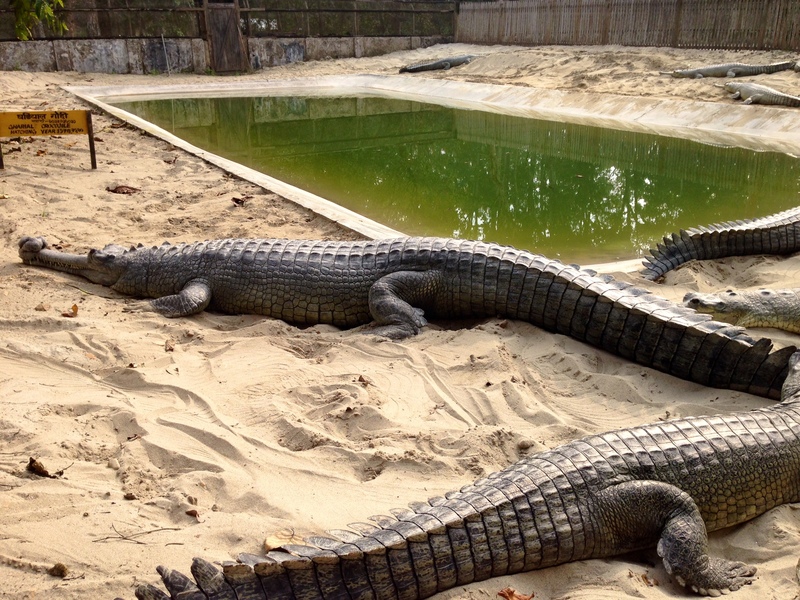 Between 1981 and 2013, 891 Gharials have been released into the National Park from the Gharial Breeding Centre. Whilst Gharial populations outside the National Park continue to decline, recent surveys suggest that the breeding program is having a positive effect in stabilising and slowly increasing the populations within. 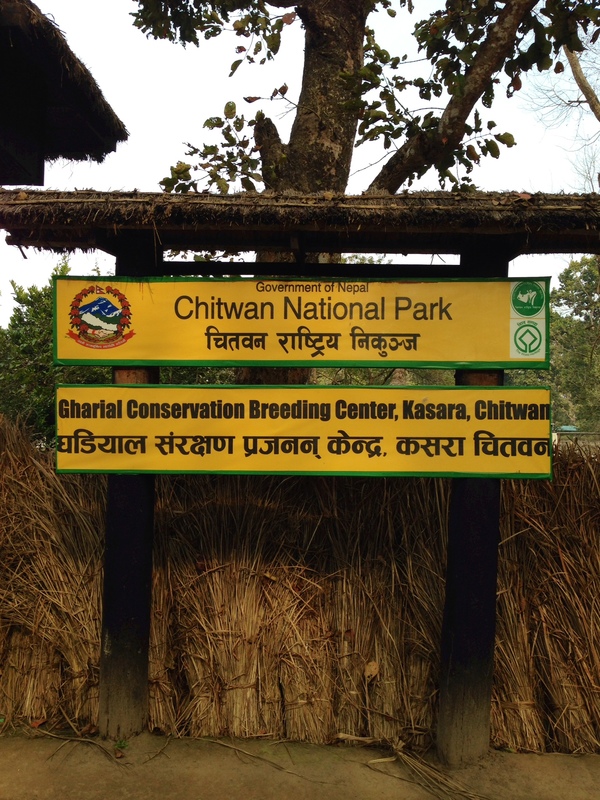 The Chitwan National Park provides a prime example of how effective ecotourism in conjunction with Government funding and assistance can contribute to preserving biodiversity. During my short time in the National Park, not only was I lucky enough to see wild Gharials but I also saw rhino, elephant, sloth bears, leopards, many species of bird and perhaps one of the most memorable moments of my life, a wild bengal tiger. The National Park is heavily patrolled by armed soldiers and poaching has almost been completely eradicated. Whilst the future of the Gharial in the wild still remains uncertain, with continued conservation efforts one thing is certain. There is still hope. Acknowledgements: I would like to thank the staff of the Gharial Breeding Centre for their assistance. All facts and statistics were provided by the Centre.